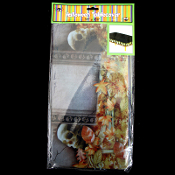 Halloween theme fall colors leaves with Skull and Tombstone border print frame on clear background. Table or cloth color shows through. Looks great over solid black or any solid color!